Dr. Osama Sohaib is a Lecturer at the School of Information, Systems and Modelling, Faculty of Engineering and Information Technology. He received his Ph.D. (Information Systems) from the University of Technology Sydney (UTS) in 2015. He is also a Program Coordinator/Academic Advisor of the Master of Information Technology (Business Information Systems) degree course at the School of Information, Systems, and Modelling. He has taught many subjects at the undergraduate and postgraduate level in the area of Information systems and Software engineering at the UTS and Victoria University Sydney. 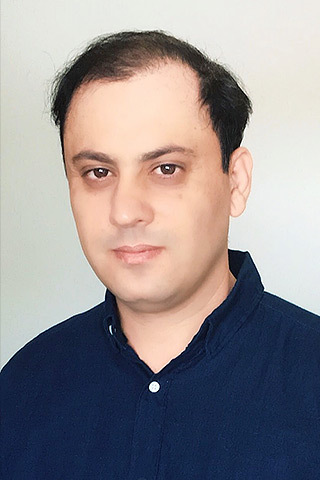 His research interests areas include Human-Computer Interaction (HCI), agile software engineering, and information systems. Reviewing articles for peer-reviewed journals and conferences. Consumer autonomy and choice in the age of Big Data. For university websites to be successful and to increase the chance of converting a prospective student into a current student, it is necessary to increase the visibility and accessibility of all related content so that a student can achieve their desired task in the fastest possible time. The criteria for evaluating university websites are very vague and are usually unknown to most developers, which adversely impacts the user-experience of the students visiting such websites. To solve this problem, we devised a usability metric and examined the leading university websites to analyze whether these websites were able to meet the requirements of students. In this research, we applied qualitative and quantitative approaches by considering 300 students and evaluating 86 university websites (26 from Canada, 30 from the United States, and 30 from Europe) based on a six-attribute metric comprising navigation, organization, ease of use (simplicity), design (layout), communication and content. From the evaluation results, we find that the 88% of the students are satisfied with our proposed usability attributes, but that most universities fail to meet basic standards of usability as desired by the students. The findings also show that the usability evaluation score for each usability feature varies from country to country, such as for (1) multiple language support 23% of the Canadian websites, 63% of the European websites and none of the USA websites has the feature; for (2) Scholarships/Funding/Financial Aid link 24% of the Canadian websites, 80% of the European and the USA websites has the feature; for (3) admission link 88% of the Canadian websites, 20% of the European websites and 90% of the USA websites has the feature. In addition, from the evaluative result we find that our proposed approach will not only increase the usability of academic websites but will also provide an easiest way to covert prospective student inquiries into enrollment opportunities. Technology business incubators support economic growth by developing innovative technologies. However, assessing the performance of technology business incubators in Saudi Arabia has not well recognized. This study provides a conceptual framework for assessing technology business incubators based on knowledge sharing practices and sharing, diffusion of innovation and individual creativity. Partial least squares structural equation modelling, such as (PLS-SEM) path modelling was used to test the model. The results provide empirical insights about the performance of technology business incubators. The findings show knowledge donation and collection has positive effects on technology business incubator. The importance-performance map analysis shows additional findings and conclusions for managerial actions. The purpose of this study is to propose an interpersonal trust (iTrust) model to better understand the online consumer cognitive and affective reactions in a B2C website. This study provides proposition on the influence of culture (Individualistic and Collectivistic) on the relationship between cognitive-based and web design and affect-based trust to buyer behavior aspects towards purchase intention in B2C e-business website. It is important to understand online purchasing perceptions between two different cultural groups because the Individualistic online consumer trust may be higher than the Collectivistic and vice versa. but also in one culturally diverse country such as Australia. Sohaib, O. & Kang, K. 2014, 'Cultural aspects of business-to-consumer (B2C) E-commerce: Acomparative analysis of Pakistan and Australia', Electronic Journal of Information Systems in Developing Countries, vol. 61, no. 1. It is generally believed that Business to-Consumer (B2C) e-commerce will help firms to improve productivity to the global market both in developing and developed countries. This study examines the extent of B2C websites communication differentiation on cultural ground. Through a content analysis, Hofstede's and Hall's cultural factors were examined in 64 B2C e-commerce websites of Pakistan and Australia. To test for the difference an independent samples t-test was conducted. The results show that B2C websites somehow reflects the cultural environment that surrounds the online buyers. It appears that to influence online buyers to purchase, firms need to develop culturally adapted websites. This study provides some indications that the cultural trend in B2C websites is providing opportunities to business firms to make changes to their market strategies to better trigger their online sale by targeting two different cultures. Kang, K. & Sohaib, O. 2012, 'The Effect of Technology, Human and Social Networks in Serviceable Cross-Cultural B2C websites', Journal of Internet and e-Business Studies, vol. 2012, pp. 1796-1805.
Business to-Consumer (B2C) e-commerce becomes more composite with the emerging growth of web services. Online Buyer expectations are often not taken into consideration in global and local B2C websites. Serviceability has made its approach into the e-commerce mainstream and emphases on how the web developers have developed their role to understand buyers actions of purchasing and accessibility to accommodate evolving business process. For a B2C e-commerce website to engage online-buyers across cultures web designer should not ignore the technology and human related elements. This study is proposing a conceptual framework that describes the importance of serviceable B2C e-commerce that connects technology factors such as web content accessibility guidelines, human factors such as, cultural issues, buyers experience, cognitive behavior, religious attitude and social networking elements into B2C e-commerce websites. In the recent years, wireless technologies and devices have progressed dramatically that has augmented the demand for electromagnetic spectrum. Some research work showed that spectrum access and provision to user is not possible due to shortage of spectrum but federal communication commission refused to accept this theory and indicated that the spectrum is available since most of the frequency bands are underutilized. In order to allow the use of these frequency bands without interference, cognitive radio was proposed that characterizes the growing intelligence of radio systems can adapt to the radio environment, allowing opportunistic usage and sharing with the existing uses of spectrum. To take this concept a step further, we propose to use intelligent agent for spectrum management in the context of cognitive radio in this paper. In our proposed architecture, agents are embedded in the radio devices that coordinate their operations to benefit from network and avoid interference with the primary user. Agents carry a set of modules to gather information about the terminal status and the radio environment and act accordingly to the constraints of the user application. With the increase in the growth of internet since 1990 WorldWide Web have gained a worldwide popularity.Web has become an ultimate source of information throughout the world. The web has been a source of information, knowledge, entertainment and carrying out different tasks such as online shopping, reservation etc. Every one finds ways to the web due to easiness of access and the bulk of information that has been available so ways to make web more attractive and easy to interact with has been an issue under discussion since its inception. In this paper we have focused how to make a webpage more usable for different age group in terms of readability. We have focused on eight eternal readability factors i.e. color contrast, white space, line spacing, font style, font size, text width, headings, graphics and animation. These eight factors are compared that how different age group people behave with the web applications by varying these eight factors. Based on literature review we have proposed an idea that how to make web more readable for people of different age groups e.g. children, teenagers and old /senior users. © 2018 IEEE. Web accessibility related to cloud computing is more concerned at the application level where a human interacts with an application via a user interface. Although previous research has identified web accessibility influences on website effectiveness, the evaluation of the relative importance of web accessibility on software-as-a-service (SaaS) e-commerce platform has not been empirically determined. This study evaluates the web accessibility of SaaS e-commerce platform websites. The web accessibility features from the cloud accessibility taxonomy framework were evaluated for people with disabilities such as sensory (hearing and vision), motor (limited use of hands) and cognitive (language and learning disabilities) impairments. We conducted an expert evaluation using Fuzzy TOPSIS (Technique for Order of Preference by Similarity to Ideal Solution). The results show Shopify cloud-based e-commerce platform has a high number of web accessibility features from the proposed cloud accessibility framework followed by 3dCart, BigCommerce, Volusion, and WooCommerce. Cloud computing promises enhanced scalability, flexibility, and cost-efficiency. In practice, however, there are many uncertainties about the usage of cloud computing resources in the e-commerce context. As e-commerce is dependent on a reliable and secure online store, it is important for decision makers to adopt an optimal cloud computing mode (Such as SaaS, PaaS and IaaS). This study assesses the factors associated with cloud-based e-commerce based on TOE (technological, organizational, and environmental) framework using multi-criteria decision-making technique (Fuzzy TOPSIS). The results show that Fuzzy TOPSIS (Technique for Order of Preference by Similarity to Ideal Solution) approach proposes software-as-a-service (SaaS) as the best choice for e-commerce business. Given the economic growth challenges facing countries all around the world, the importance of the initiative of technology business incubators in developing the economic growth of countries has been recognized. Technology business incubators are included in many of the processes that support economic growth, such as job creation and developing innovative technologies. This research paper examined how the knowledge sharing aspects impact technology business incubator performance in Saudi Arabia. The findings provide key factors affecting knowledge-sharing process towards technology incubator performance. In most organizations, knowledge sharing is often lacking when it comes to business systems success. the concept of knowledge sharing and user motivation. factors influencing citizens' intention to engage in e-participation on Saudi e-government websites. norm, Website design, Attitude, Trust) has a significant impact on citizens' intention to engage in eparticipation. with diverse degrees of uncertainty avoidance and individualism. Sohaib, O & Kang, K 2011, 'The Role of Technology, Human and Social Networks in Serviceable Cross-Culture Business to-Consumer (B2C) Websites', INNOVATION VISION 2020: SUSTAINABLE GROWTH, ENTREPRENEURSHIP, AND ECONOMIC DEVELOPMENT, VOLS 1-4, 19th International-Business-Information-Management-Association Conference, INT BUSINESS INFORMATION MANAGEMENT ASSOC-IBIMA, Barcelona, SPAIN, pp. 1796-1805. Sohaib, O. & Khan, K. 2010, 'Integrating usability engineering and agile software development: A literature review', Computer Design and Applications (ICCDA), 2010 International Conference on, Computer Design and Applications (ICCDA), 2010 International Conference on, IEEE, pp. V2-32-V2-38. The various agile software development methodologies have promoted since their inception and even demanded high degree to improve the quality of the software product. Usability engineering has made its way into the software mainstream and has caught the attention of software engineers and researchers worldwide due to rapidly growing and volatile internet software industry, despite their different perspectives on creating software both have a major role in making good software. Usability focuses on how the end users will work with the software and agile development focuses on how the software should be developed. The way these two perspectives are being combined in practice is still not well understood. This study is a preliminary literature review that describes the key question that how usability-engineering practices should be integrated with agile software development in order to make stronger and effective usable software system. This paper focuses on identifying the tensions between usability and agile methods. The research aim is to identify the common approach of agile methods and usability engineering by surveying extensive related work on integration of usability and agile methods. © 2010 IEEE.